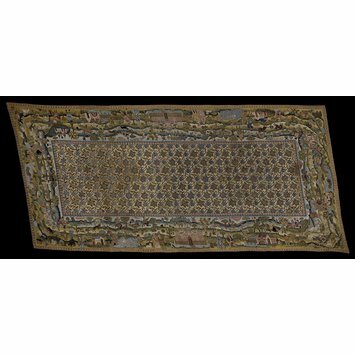 This embroidery is described as a carpet, but it was intended for laying on a table as a costly and highly decorative cover, rather than on the floor. Its pictorial border would hang down vertically from the table's edge. The carpet would be covered up or removed if the table was used. 'Foot carpets' occasionally appear in contemporary paintings, in which case they are intended to indicate the high social standing of the sitter who can afford to have such an object underfoot. This carpet was produced in a professional workshop, and the absence of heraldry suggests that it was made for sale on the open market rather than for a specific commission. The embroidery is exceptionally fine, with approximately 62 stitches to the square centimetre. The tension of the embroidery stitches has pulled the canvas from a rectangular into a parallelogram shape. The design of the carpet has sometimes been described as depicting humankind's progression from the wild state to civilisation. It can also be seen more simply as a celebration of country pursuits. There are scenes of hunting, fishing and shooting, as well as the rural occupations of shepherd, milkmaid and miller, with watermill and windmill. Rural scenes were very popular in embroidered furnishings in the later 16th and early 17th century. Central field is a grid with scrolling vine stems and bunches of grapes. There is a deep border on each side showing a country landscape. The canvas gound is in one piece, pulled out of shape by the tension of the embroidery stitches. About 400 stitches to the square inch. Owned by the Earls of Bradford at Castle Bromwich Hall, West Midlands.